Buying heavy-duty tools is not a trivial investment. Therefore, it is important to choose the one best-suited for your projects, while keeping in mind affordability, mobility and durability. The Bosch 4100-09 provides those three elements and much more. This places it among the best worksite table saws within its price range. The Bosch 4100-09 is quite safe, easy to use and it is a piece of top-quality equipment that can be acquired for an affordable price. This tool delivers exceptional portability and professional rip capacity and whatever the job is, it can get it done. Additionally, the entire system can be attached and detached within seconds. The life of the tool is extended by an integrated sub base that protects the base of the saw. Easy transport through its wheeled base system. Without proper maintenance, the more could become really loud over time. The work surface could be a little bigger. Does the saw create a lot of dust? It does not generate a ton of dust as the dust bag attachment is quite large and actually works very well. However, the exhaust can become clogged over time. A shop vac attachment can be used from time to time to completely rid the saw of dust. Is the Bosch 4100-09 very loud? No. The sound it produces is quite normal for a table saw. Where was the table saw made? It is made in Taiwan. This table saw far exceeded my expectations. It has been part of my arsenal for the past six years and I have only experienced a few trivial inconveniences. This tool is outstanding in every way. I love the accuracy of the rips it delivers and its Crosscut sled makes it even more useful. Set up and portability are simple and effortless thanks to the wheeled base. I no longer have collapse it or fold it for winter storage; however, that feature is a remarkable benefit. Before I bought it, I compared it with all the professional-grade portable table saws. For me it was, and still is, a must-have tool. This unit offers lots of great features to both professionals and do-it-yourselfers. Its portable design is one of the first things many people notice. If you are in the market for a highly mobile unit, this could very well be the ideal one for you. Other great features include its safety, precision and cost. For the quality it delivers, the cost could be higher. However, the manufacturer ensured that it remains accessible even for individuals with a tight budget. Its ground-breaking, gravity-rise stand makes it remarkable for any construction site, irrespective of the space available. Whenever you run out of free space, the unit can be rolled on its wheels to the next available space. This table saw has basic elements that heighten its safety. These include a blade guard and it anti-kickback system. One of the primary causes of injuries is kickbacks. This can occur at any moment and there is not much that can be done to prevent them. However, units with a built-in, anti-kickback mechanism effectively prevent it from happening. The blade guard is a great addition to an already remarkable tool; it helps tremendously to keep you safe and sound. Among the most noticeable things about this specific model is its sturdy wheeled base. Not only does it enhance portability, its capacity to be adjusted however you want amplifies its usefulness as well. Is it widely viewed as being highly mobile and adjustable. The materials used to manufacture the components of the saw are quite reliable and sturdy. It also has a high level of accuracy, which means the precision of this table saw is remarkable, even for a beginner. The shrewd design of the stand allows a single lever to open or collapse the saw. There are two transport wheels that enable easier movement and the stand can also be used as a pulling handle. The measurement of the saw is 39 x 30 x 20 inches; this means it is quite compact. There are 37.5 inches between the work surface and the floor. There is also a powder-coat finish that makes the stand very durable and corrosion-resistant. The port used for dust collection is designed to be out of the user’s way. This indicates that you will not have to deal with the unpleasantness of sawdust flying around. The collecting port is pretty good; however, some amount of debris will still fly around the worksite. As long as protective goggles are worn, the dust will not be a major issue. The saw has various attachments and accessories like rip, miter and blade guard. There are specially-designed hangars for each. If you plan on utilizing other blades, there is a well where all blades can be stored. Who Can Use This Table Saw? One of the main advantages of the Bosch 4100-09 is that it can be easily mastered by both professionals and do-it-yourselfers. Professionals appreciate its accuracy and precision and hobbyists enjoy its ease of use. Both groups like its incredible features and affordable price. What You Didn’t Like about This Table Saw? Not many things are there to dislike about the Bosch 4100-09. Some individuals do not like the fact that it was made in Taiwan, but I do not consider its country of origin crucial. The quality of this table saw is quite evident in the materials used to make its parts and accessories. There have also been a few complaints about the fence being flimsy but I have had no issues with that. How Does This Table Saw Compare to Other Table Saws? 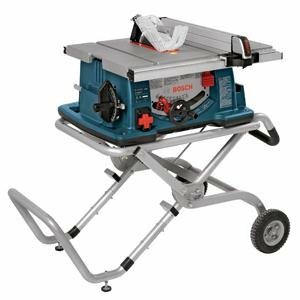 Of the portable table saws available on the market today, the Bosch 4100-09 Table Saw and the Dewalt DW745 Table Saw are among the most popular. The two saws are quite evenly matched in the area of power and dust collection. If your preference is for a lightweight table saw, the Dewalt would be the top pick as it is almost half the weight of the Bosch. The Dewalt is also less costly. However its Gravity Rise feature, large work table and expanded cutting capability make the Bosch 4100-09 a Cadillac among Pintos but, as should be expected, that level of luxury will reflect in the price tag. Bosch 4100-09 and Ridgid R4510 are very popular options in the mid table saws price range. The Ridgid R4510 is a huge seller as it checked a lot of boxes for contractors and woodworkers. It is also less expensive that the Bosch 4100-09. The Bosch 4100-09 has a 15-amp motor, while the Ridgid R4510 has a 13-amp. This means the Bosch has superior torque and cutting power. Both the Bosch 4100-09 and the Makita 2705X1 are high-quality devices and they have a similar set of features. The Bosch 4100-09 has an included stand that makes things a lot easier for users to transport it around. The Makita 2705X1 is less expensive but has no included stand, which makes for a slightly lower value proposition. The Makita 2705X1 is the clear choice if price is the absolute bottom line. However, for portability and avoiding the hassle of buying a stand in the future, the Bosch 4100-09 offers a better value overall. Additionally, the Bosch has more positive customer feedback and the tremendous Bosch 4100-09 review assists potential buyers in their purchasing decision. What Users Say about This Table Saw? Users seem to really love this table saw. In fact, the Bosch 4100-09 has possibly the smallest amount of negative reviews within its particular category. User reviews are among the most authentic ways of assessing the quality of a specific unit; the Bosch 4100-09 has received very little negative feedback. I think the Bosch 4100-09 is among of the finest table saws in its class; in fact, it could be the very best in its category. I could not find any major negatives about it. Its large rip capacity and powerful motor will make it a welcome addition to any workshop. The unique Gravity-Rise stand, innovative Smart Guard technology and the fact that it is highly portable are just some of the remarkable features of the Bosch 4100-09.